The Supply Technician’s main responsibility is to ensure that soldiers have enough equipment and supplies to successfully complete any task. From ammunition to zips, and everything in between, it will be your task to ensure the Army has everything it needs to get the job done. If you’re good at thinking ahead and project planning, then you could be well-suited to a career as a Supply Technician. Your main responsibility will be to ensure our troops have enough equipment and supplies to complete any task – no matter where in the world you are, and what in the world your mission. From ammunition to zips, and everything in between, it will be your task to ensure the Army has everything it needs to get the job done. 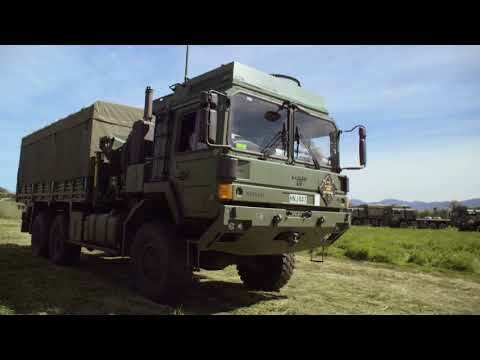 You will need to learn how to move all of the New Zealand Army’s equipment around. That means you will gain driving licences in various classes including forklift and heavy truck. You may learn how to operate our field petrol tankers. You will also receive training in SAP; an internationally used software package used by many of the worlds largest and most successful companies. While on camp, you will be in charge of the safe storage and distribution of the kit used by the Army. This will involve the ordering and sourcing of different equipment ranging from ammunition to clothing to the stationery needs for troops and support services. As well as your day to day responsibilities as a supply technician, you will also continue your soldier training including weapons, medical and radio/communications training. Supply Technicians deploy on a variety of overseas missions and postings in support of other units and contingents. The role of a Supply Technician overseas will be largely the same as while on camp, sourcing equipment and supplies as required to ensure the Army has what it needs to get the job done. Past deployments have included Afghanistan, Timor-Leste and Sinai. I've got a passion for supply and making sure things are in the right place and everyone’s got what they need. Post your initial Logistics Course you will have the opportunity to complete a number of Specialist courses to broaden your knowledge and skills as a Supply Technician. This could be from gaining new licenses, to learning how to handle and store ammunition or bulk fuel. As a Supply Technician you will have the opportunity to work in a variety of different fields and gain NZQA accredited qualifications while doing so. As a Supply Technician you could be posted to one of the main Combat Service Support Battalions, or posted to a units within NZ to provide direct 1st line support to the Combat and Combat Support troops within the NZ Army. Supply Technician's may be required to work individually within small teams or as part of a large Company sized groups. Even in the early stages of your career you may be given a lot of responsibility and asked to complete tasks with minimal guidance. As a Supply Technician there is a number of paths your career can move toward and you will gain a variety of highly transferable skills to the civilian world. Throughout your career, you will gain recognised qualifications in warehousing and inventory management, as well as occupational health and safety licences. Driver’s Licence: A Class 1 restricted driver's licence is desirable. Typing and computer skills are preferred.